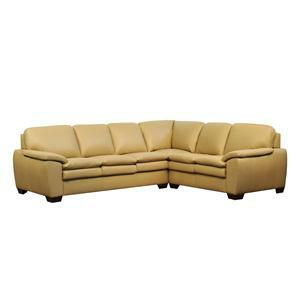 Enjoy the look of Contemporary design in your living room or den with the unique style of the "Darlene" sofa. 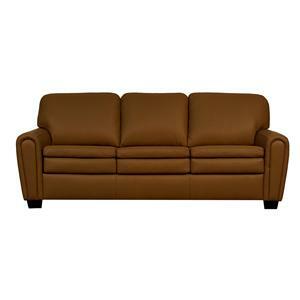 Featuring knife edge classic backs with Euro seats, the Darlene sofa is a must for any modern style home. Relax with friends or family while watching television or reading a book with this elegant and supportive piece. Choose from a wide variety of leathers to customize the piece to match your own personal decor! Add a casual and comfortable appeal to your home’s décor with the Joycey Sectional. This sectional consists of a left arm facing sofa, square corner, and a right arm facing loveseat to create a spacious and inviting seating solution for your home. High quality construction is seen with its knife edge classic back and classic style seat. Offering the utmost comfort whether you’re visiting with family and friends, reading a novel, or watching your favorite shows and movies, this sectional is sure to fit into any room’s décor. The Julianna Sectional offers the utmost in quality and luxurious comfort. This sectional consists of a left arm facing sofa, a square corner, and right arm facing loveseat to create a spacious and inviting seating solution for your home. The knife edge classic back adds a modern touch to your décor while the double cushions of the pillow-top seats provide a plush and comfortable experience. 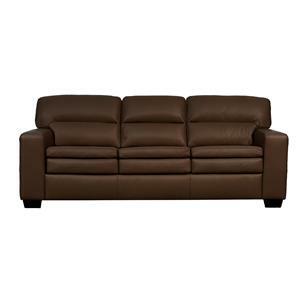 The Francesca Sectional offers the utmost in quality and luxurious comfort. 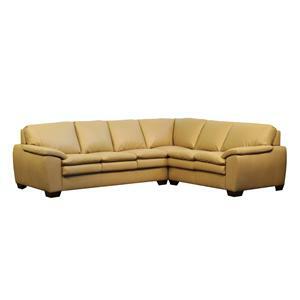 This sectional consists of a left arm facing sofa, square corner, and right arm facing loveseat to create a spacious and inviting seating solution for your home. The knife edge classic back adds a modern touch to your décor while the euro seat’s double cushion feature provides a plush and comfortable seat. Position the Jenna Sectional in your living room, family room, den, or entertainment room and create a casual and comfortable atmosphere to relax in. 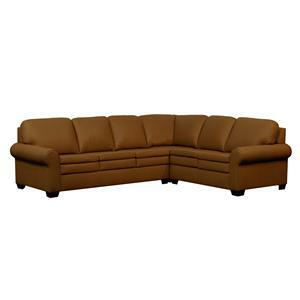 This sectional consists of a left arm facing sofa, square corner, and right arm facing loveseat to create a spacious and inviting seating solution for your home. The box band classic back design offers the utmost support while the seat cushions provide the ultimate comfort and luxury with its unique two-layer pillow-top seat cushions. Experience the utmost comfort and luxury with the Fiona Sectional. Consisting of a left arm facing sofa, square corner, and right arm facing loveseat, this sectional solves your seating needs effectively. With its knife edge split back and euro seat, this sectional’s double cushion feature provides plush seating for an array of activities including visiting with family and friends, watching TV shows and movies, or taking an afternoon nap. Position the Brandy Sectional in your living room, family room, den, or entertainment room and create a casual and comfortable atmosphere to relax in. This sectional consists of a left arm facing sofa, square corner, and right arm facing loveseat to create a spacious and inviting seating solution for your home. The box band classic back design offers the utmost support while the seat cushions provide the ultimate comfort and luxury with its unique two-layer euro seat cushions. Smooth, clean lines and modern styling give the "Daisy" sofa a look you and your family will enjoy. Featuring Classic Box Band Backs and Euro seats, the Daisy sofa offers you supportive comfort with the look of Contemporary design. Great for your living room or den, enjoy the plush feel of supportive cushions as you watch television with friends or read a book. Whatever your lifestyle, the Daisy sofa is there for you, providing softness and style. 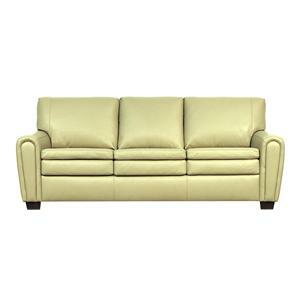 The Faith Sofa offers luxurious style and comfort with its box band split back and euro seat. The double layer of seat cushion truly creates a comfortable and relaxing experience whether you’re reading a novel, visiting with family and friends, or watching your favorite shows and movies. With your choice of leather or fabric upholstery, the Faith Sofa is sure to fit into any room’s décor, including the living room, family room, den, or entertainment room. Position the Francine Sofa in your living room, family room, den, or entertainment room and create a casual and comfortable atmosphere to relax in. This sofa features a box band classic back design for the utmost support. The seat cushions feature a unique euro seat, offering the ultimate comfort and luxury with its two-layer cushion. The simplicity of the track arms and square tapered accent feet adds an uncluttered and inviting appeal to the décor of your living spaces.